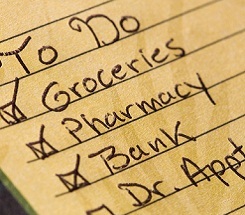 Do you spend endless hours making “To Do” Lists? Did they really help you to stay sane and organized? Or did their very existence make you more stressed than you were before you created them? In my journey as an educator, I’ve come to discover that we are great list makers. If there’s a task to be done, we’ve got a list for it. Maybe even three! The problem is that these lists are often too long, and unrealistic. Recently, I read an article in a popular magazine on re-booting the “To Do” List and thought it would be a fun idea to share it from an educator’s perspective. So…today, let’s look at some ways to set up that “To Do” List in a slightly different manner. Oh, and by the way—that list should be able to fit neatly on a Post-it! How long has it been since you took the time to connect with a friend? Research shows that a good to do list includes connecting with at least one friend, daily. This is news to me! But it sure makes sense. When we maintain our relationships, we stay energized. When we side-step them, they only increase our stress. I know that in my days as a Principal, when I took time for a call from a friend, even for just 15 minutes, it made me feel so refreshed! Been awhile since you connected with that long-lost friend? No worries! Just make the call and get caught up. You’ll be glad you did! Do you worry about the promised favors that you never seem to be able to follow through with? According to research, we should all follow through. Currently, I have an elderly family member that’s recuperating at home from a long hospital stay. Although she lives close by, I frequently get too caught up in my work to make time for a visit. I’ve since had a change of heart and have begun to plan for weekly visits. Nothing can be more important than keeping that commitment to a student, parent, or family member. When we follow through, we’ll always feel better. Those we keep commitments with will know that they were important enough to us to make this happen, even in our busiest day. Did you make the New Year’s resolution to work-out? Have you kept it? Probably not! According to time management experts, doing something for ourselves – particularly something physical – every day is of utmost importance. And a little can go a long way. How about a short walk with a colleague at lunchtime, instead of sitting in the staff room? Even something as simple as that can pay off in supporting us to stay motivated through the day. It can not only increase our sense of happiness, but also our health! Is your classroom in need of a face-lift? Does it seem too overpowering to take on? Time management research says we should break down those large-scale projects into smaller, less overwhelming ones. It also says that we should put only one of those on our list each week. By selecting a single significant element to tackle – say, organizing the classroom library – instead of a laundry list of re-do’s, we will be able to accomplish much more in the long run. This really makes a lot of sense to me. I wish I’d practiced this sooner. What classroom doesn’t have a “mini-crisis” from time to time. Or, how about the call from our child’s school or the carpool driver who’s not going to make it because they’re feeling ill? Leaving what the time management experts call a “cushion to accommodate the unexpected” will help keep your daily plan from going completely down the drain. As an educator we’re balancing so many tasks, typically at one time, that we forget to leave a spot on the To Do List to breathe. Be sure that you have this cushion for the urgent matters that arise in your daily work schedule and hopefully you’ll be a much happier camper! This was a fun opportunity for me to be able to reflect on my need to re-boot my own daily “To Do” List. I hope you’ll think about trying at least one of these tips and see if they make a difference in your day!